Anyone had any others recently? Don’t think I will be seeing anything around here for another month or more Hazel, its still to cold for them to come out. Had tadpoles with legs last year but they simply vanished! I have had good success with frog spawn, but I will give a little advice my late wife loved pebbles and placed them all around the pond and when the froglets were leaving the pond they stuck to the pebbles and with the sun being out they died I then covered the pond with a shade so they could get passed the pebbles and into the grass surrounding the pond. Thanks for that James, we're digging a pond at the moment, at least we were until we had 6 inches of rain in the last few weeks! I'll have to look at the design with that in mind! I rescued this critter from the middle of local busy traffic hill, (It was reluctant to move,I wanted to insure it was not injured already) eventually hopping into the hedgerow. It didn't turn into a Prince did it? 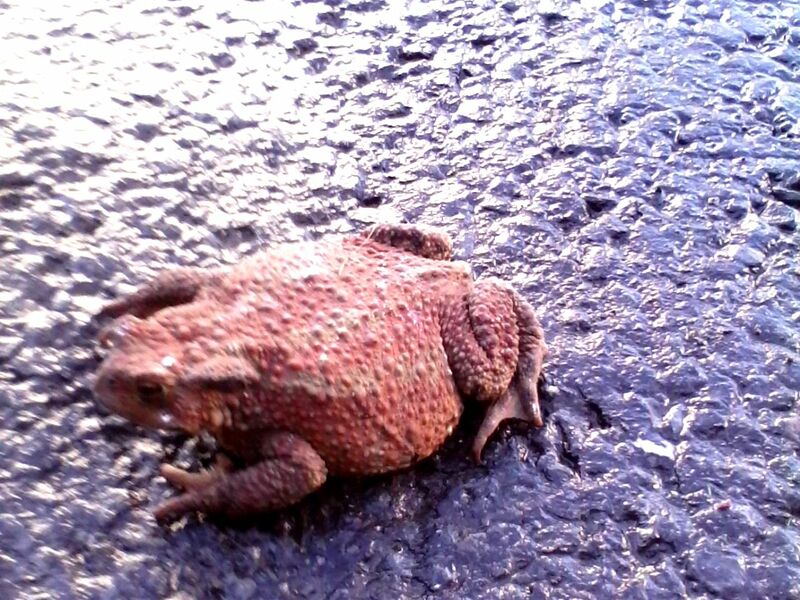 LOL The poor Toads really suffer on the roads around breeding times. CHOL:):) he was certainly a beautiful specimen . A tree frog on the shutters last night, luckily it didn't get crushed! I love the variety of nature related threads on the forum. We have a small pond in our garden, that is home to two carp. At one time, it used to be home to a lot of frogs, and a toad, but they all seem to have disappeared.